More than just a zip line - it's a one of a kind adventure. You won't find this glorious scenery anywhere else. This Florida property is a rare gem that even the locals didn't know existed. The terrain on this nearly 100 acres is spellbinding. If viewing this property from the highway, it looks like woods and a field of grass. The real magic begins when the tree line gaps and spectacular cliff formations come into view. From the welcome center guests are treated to views of massive canyon walls as they zip across the best zip lines in Florida including 9 different zip lines, traversing 3 different rope and adventure bridges, and it all ends with a thrilling rappel. Heavy forests line the top of the cliffs.....all combined it is the perfect setting for a zipline wonderland! At The Canyons Zip Line & Canopy Tours you get the best of both worlds, the awe-inspiring feelings you experience while standing high above the forest floor on a tree stand coupled with the absolute thrill of zipping over open water with the wind in your face and a clear panoramic view of the heart of The Canyons. 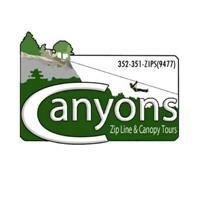 Zip Line & Canopy Tour for Two Adults. Tour duration is approximately 2.5 hours. Before your flight through the forest begins, your guides will teach you proper zipping and safety techniques. The amazing adventure takes you through 9 zip lines, 2 rope bridges and a thrilling rappel. Advanced Reservations Required. Subject to availability and inclement weather. Participant requirements and restrictions apply.